Joshua Davidson, CEO & Founder of Chop Dawg, talks with student entrepreneurs in the Penn YouthHack Startup School and Ventures programs. For Wharton student Abhinav Kajaria (‘20), entrepreneurship is in his blood. His family’s home-improvement business was started by his grandfather, passed down to his father, and soon after he graduates, Kajaria – who co-founded Mumbai-based micro-finance NGO 1Ghar while still in high school – will take over the reins, “helping it grow to new heights,” he told Learning Lab project delivery manager Lan Ngo, in a recent interview. Thus, it was only natural that Kajaria was drawn to the Penn chapter of YouthHack Philly, through which he currently serves as director of the Startup School – a semester-long bootcamp designed to introduce incoming students to the campus’ robust startup culture. YouthHack was started in the Philippines by David Ongchoco (Penn ‘18) four years ago, with the goal of enabling students in that area of the world to get involved in startups, technology and entrepreneurship. By 2015, the initiative had expanded to Philadelphia, sparking the YouthHack Undergraduate Penn Society (YUPS), founded to help students learn more about technology startups and entrepreneurship through experiential and action-based learning programs. Since that time it has become a crucial component in the citywide effort to build Philadelphia’s startup ecosystem. 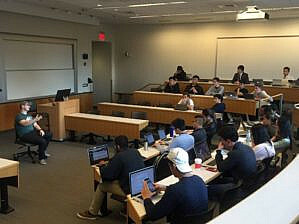 The Startup School and the YouthHack Ventures Accelerator program are unique to the Penn chapter of the worldwide YouthHack organization, Kajaria notes. The Startup School is aimed at students who want to learn about startups but have no entrepreneurial experience. “We help them develop a concept, a business model, and then form teams that stick on one idea through all the processes required to build a startup around it, and eventually put the idea out to benefit the overall community,” he explains. Serial entrepreneurs, professors, venture capitalists, and student entrepreneurs teach weekly lessons ranging from ideation to building an MVP to digital marketing and more. At the end of the program, students pitch their business idea to investors. The Ventures Accelerator, on the other hand, adopts experienced student entrepreneurs seeking to launch their startups, providing intensive mentoring and workshops, while helping them identify resources and connect with in-place YUPS networks so they can build their concept and products over the course of a semester. Kajaria joined the core team running the first class of Startup School when he was a sophomore, using his tech skills to build a database of people, speakers and founders coming through the Penn chapter of YouthHack. He then transitioned to running the group itself, building a strong program of student-engagement and popular events around it. It was in this role he first heard about Wharton Prof. Ethan Mollick’s Startup Game – a simulation designed in conjunction with the Learning Lab to immerse students in the direct experience of launching (and getting funding for) an early-stage business. Intrigued at the game’s application within the Startup School, Kajaria enrolled in a MGMT 230 course, where the game was played. “It provided a great foundation for understanding what running startup is all about, and whether pursuing entrepreneurship studies is a good fit for you,” he told Ngo, who oversaw the simulation for his class. Deeming it a perfect fit for the students he was currently working with via YUPS, Kajaria then ran the game at the Startup School. To learn more about the Startup Game, email the Learning Lab team at learninglab@wharton.upenn.edu.